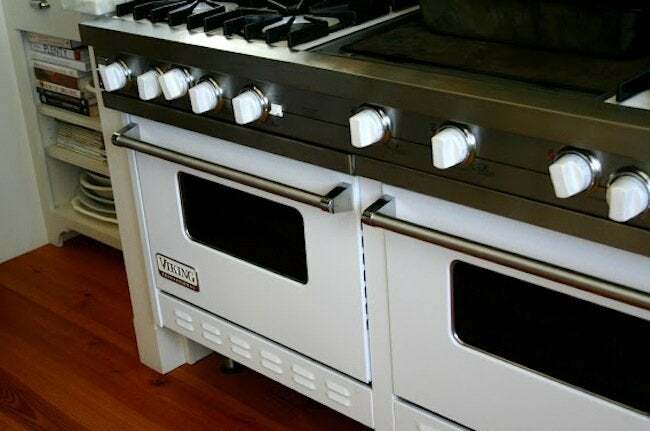 Is your enamel stove looking a little worse for wear? You can restore the appliance to gleaming, pristine condition by repairing any portions of the surface that have gotten chipped in the course of cooking. There’s something so crisp and clean about a kitchen with a traditional, white porcelain enamel stove. But sometimes all it takes to chip that gleaming surface is a dropped pan or a clumsily replaced grate. Over time, the exposed metal can rust, not only worsening the look but also damaging the appliance. Fortunately, it’s not too hard to repair those scratches and dings, getting your stove to look as good as new. Here’s how. First, purchase a porcelain enamel repair kit in a color to match your appliance. These kits can be found online or at home improvement or hardware stores. Start by washing and thoroughly drying the damaged spot. Then sand the chipped area with 400-grit sandpaper, wiping it down with a damp rag. Make sure the area’s dust-free and completely dry before continuing. Shake the bottle of liquid enamel well, then apply according to the directions on the repair kit. Typically, you’ll use a provided applicator to brush or dab some of the liquid onto the chip. One application should do it, but for deeper dings you’ll probably need several coats to build up an even surface. Allow each coat to dry (according to the manufacturer’s directions) before adding another. Be sure to wipe off any drips with a dry rag as you’re working.